Wisconsin Gov. Scott Walker speaks during the Iowa Freedom Summit on Jan. 24 in Des Moines. Scott Walker looks like a 2016 winner. He’s popular. He’s a governor. He’s won three elections in four years. And to get a little more technical: Walker’s net favorability rating (favorable rating minus unfavorable rating) compared to his name recognition lines up with past presidential candidates who won their party’s nominations. As I’ve written, this is a useful way to gauge the strength of potential candidates so early in a campaign season, when horse-race polls are less predictive: Eventual nominees start campaigns either well-known and popular in their party, or relatively unknown. Although this may be a good way to identify likely losers, it doesn’t help us identify surefire winners. Walker may be the real thing, but it’s too early to know. So, as candidates take their turn in the spotlight over the next year — the Wisconsin governor just had his go-round — keep this in mind: Almost every presidential race features at least one popular top-tier candidate who flamed out in epic fashion. 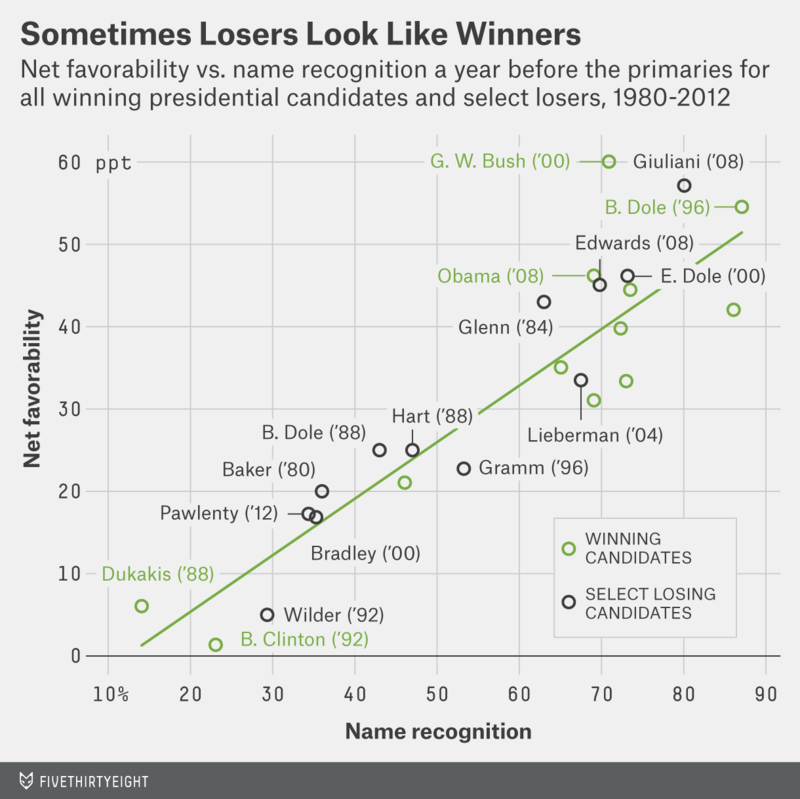 To demonstrate the point, I picked an eventual loser from each primary since 1980 and looked at his or her net favorable rating and name recognition in the party from January to June in the year before the primaries. All of the losers in the chart below declared they were running.1 I have also plotted the winners for each year, so we can compare. Keep these 10 candidates in mind over the next several months, especially when you’re reading some smart take about why some candidate is destined to dominate the field. Howard Baker, Republican, 1980: Baker, who had been the Senate minority leader, was more popular in the first half of 1979 than the eventual winner, Ronald Reagan, was. But Baker lost support, in part, because he favored giving the Panama Canal to the Panamanians. After third-place finishes in Iowa and New Hampshire, Baker faded; he won just 1.4 percent of the national primary vote. John Glenn, Democrat, 1984: Glenn had a better early net favorable rating than eventual nominee Walter Mondale, even though Mondale was better known. Yet Glenn, like any successful astronaut, came back to Earth. He had little personality and ran a poor campaign. He won no primaries and just 3.4 percent of the nationwide primary vote. Gary Hart, Democrat, 1988: This campaign was a disaster. Hart was a front-runner in early polls and had a solid net favorable rating. Then came the Donna Rice scandal, and Hart dropped out of the race. Hart would later re-enter the 1988 nomination fight, only to win zero primaries. Doug Wilder, Democrat, 1992: Wilder was looking to become the first African-American candidate nominated by either major party. As governor of a Southern state, Virginia, he was a standout in a field of unknowns. Wilder’s early numbers looked somewhat better than Bill Clinton’s. But without a message or any real fundraising efforts, Wilder didn’t even last to the Iowa caucus. Phil Gramm, Republican, 1996: Gramm did a lot of things right, and it didn’t matter. Gramm was a big-time conservative who raised a ton of money and had the best early favorable ratings for any candidate not named Bob Dole. Gramm, though, would end up losing the anti-Dole role to Pat Buchanan, who had an awful early net favorable rating. Gramm won no primaries and just 0.5 percent of the national primary vote. Elizabeth Dole, Republican, 2000: Although George W. Bush was very popular in early 1999, Dole was no slouch. She had been head of the Red Cross, and she had served as both secretary of labor and transportation. Her early net favorable ratings were identical to Barack Obama’s in 2007, but she couldn’t raise money and was out of the race by October 1999. John Edwards, Democrat, 2008: Speaking of Democratic vice presidential nominees, John Edwards’s net favorable rating in early 2007 was only 1 percentage point lower than Obama’s, and both had pretty much the same name recognition. But what everyone saw as a three-person top-tier — Obama, Hillary Clinton and Edwards — turned out to be a duo, with Edwards left out in the cold. He placed second in the Iowa caucus, and his campaign was over. Rudy Giuliani, Republican, 2008: Giuliani, who earned the moniker “America’s mayor” after the Sept. 11, 2001, terror attacks, may be the biggest dud on this list. He had a better net favorable rating in early 2007 than every nonincumbent presidential nominee since 1980 except for George W. Bush. Once Republican voters found out how moderate Giuliani was on many issues, the jig was up. Giuliani never came close to winning a single primary. Tim Pawlenty, Republican, 2012: Pawlenty looks a bit like Walker. Pawlenty was a successful Republican governor who won multiple terms in a Midwest state (Minnesota) that hadn’t voted for a Republican presidential candidate in more than 30 years. Early polls showed him to be relatively unknown, but those who knew him liked him a lot. His net-favorable-to-name-recognition ratio was better than front-runner Mitt Romney’s. Pawlenty, though, was … well, dull. He was afraid to attack in debates. After a loss in the Iowa straw poll, he packed in his campaign. Of course, there are other popular candidates who turned out to be losers, too. In 2012, for example, there were many Republicans who had a turn atop the polls.